Madonna, who has been living in Portugal since 2017, was set to film a video for the song "Indian Summer" in the Quinta Nova de Assunção palace in Sintra, a resort city near Lisbon. In the script for the music video, Madonna was meant to pose next to the animal on the ground. But local authorities said a horse would threaten the safety of the building, given its wooden floor sits upon wooden beams and is "unstable, which prevents it from being used for activities that cause vibrations." Madonna called her agent to complain about what was happening. "My Queen, I am doing everything I can. I have called many people and sent various messages. Unfortunately the man who makes the decision is not available, but he will be," he replied, according to messages revealed by the Portuguese newspaper Correioda Manhã. Annoyed, Madonna responded that she didn't have to wait and would film somewhere else. "I've already given a lot to this country and when I ask for a simple favor, one which will present Portugal to the world, the answer I get is negative," she told her agent, adding: "This is your fault. You convinced me to come live here." The pop star's attitude has incensed Portuguese authorities, who have reminded her of all the things they have done for her during her stay in the country. For example, Lisbon City Hall gave Madonna a reduced price on a parking spot; the soccer club S.L. Benfica welcomed her son so that he could practice regardless of his level; the international school Lycée Français Charles Lepierre accepted the singer's twin girls even though there was a waiting list; and the Portuguese government fast-tracked her residency. Mad-Eyes: please keep in mind that this story was only reported by one source. The song title has not been confirmed by any official source. The agent quotes also seem rather made up. By the time it was released in 1989, Madonna was already a bona fide superstar. Thirty years after its release, we look back at the album that established her as a meaningful artist. Madonna was already a superstar before she released Like a Prayer, which turns 30 years old this week. She had produced at least half-a-dozen era-defining hits ("Holiday," "Like a Virgin," "Material Girl," "Into the Groove," "Papa Don't Preach," and "La Isla Bonita"), and her previous album, 1986's True Blue, had sold more than 25 million copies. But, in a way, she was also strangely underrated. When Like a Prayer came out in 1989, six years after she hit the ground running with her infectious debut single, "Everybody," critics lauded Madonna for changing our conceptions around how a female pop singer could present herself and conduct her career. But they didn't necessarily regard her as a "great artist." "Critics flock to her uneven product the way liberal arts magnas flock to investment banking," Robert Christgau, the self-styled "Dean of American Rock Critics," wrote in his review of True Blue. "So desperate are they to connect to a zeitgeist that has nothing to do with them that they decide a little glamour and the right numbers add up to meaningful work, or at least 'fun.'" Like a Prayer certainly confirmed Madonna's flair for fun; with its kindergarten-friendly lyrics about "pink elephants and lemonade" and treacle-sweet, Beatles-y psychedelia, "Dear Jessie" remains one of her most charming singles. But the album as a whole, Madonna's first undisputed masterpiece, also proved once and for all that she was a meaningful artist, not just an uncommonly savvy and driven pop star. She bared her navel on the album's cover, and her soul in its songs. Even three decades later, it's difficult to separate the album from the scandal that surrounded its release. When the brilliantly provocative "Like a Prayer" video debuted in February 1989, just a day after the release of a high-profile Pepsi commercial starring Madonna, the Vatican and various religious groups condemned the clip for including allegedly blasphemous imagery. Here was Madonna dancing in front of burning crosses, kissing a Black Saint, and displaying what looked like stigmata on her palms. As the video continued causin' a commotion, Madonna stood by it, telling the New York Times that "Art should be controversial, and that's all there is to it." Pepsi bosses were so keen to distance themselves from the button-pushing singer that they pulled the commercial without trying to take back her $5 million fee. Today, Madonna still seems fabulously unbothered by the whole thing. 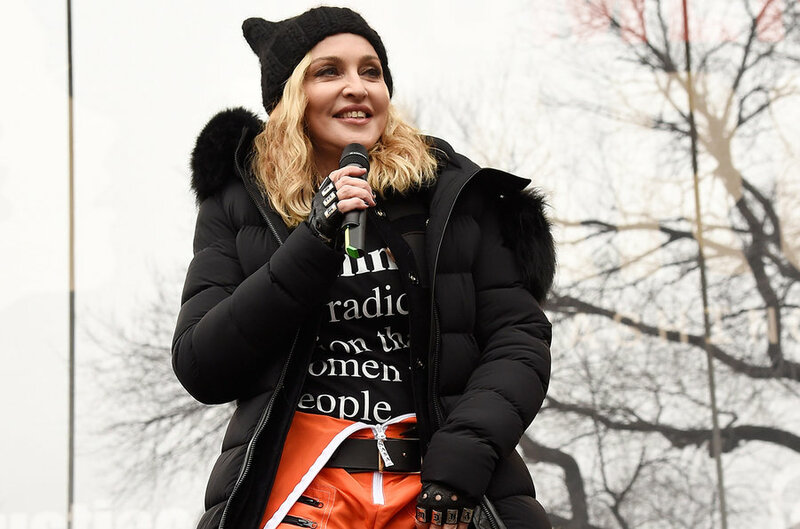 She breezily celebrated the anniversary of the "Like a Prayer" furor on Instagram earlier this month, writing: "Happy birthday to me and controversy." Atta girl! But where the "Like a Prayer" video controversy captured Madonna at her most bullish and brazen, the album that followed a few weeks later revealed new depths of honesty, vulnerability, and cathartic emotion. "Oh Father," one of eight Like a Prayer tracks that she co-wrote with regular collaborator Patrick Leonard, is a glorious, classic-sounding ballad about taking back control from male authority figures, including her father. "I lay down next to your boots and I prayed for your anger to end / Oh father, I have sinned," she sings, extending the title track's conflation of religion and real-life experience. Funk workout "Keep it Together," one of two tracks she co-wrote with another frequent collaborator, Stephen Bray, explores how family ties can feel suffocating and comforting at the same time. "Promise to Try," another stellar ballad, finds Madonna grappling with the memory of her mother, who died when she was just five years old. "She's a faded smile frozen in time," she sings achingly. "I'm still hanging on, but I'm doing it wrong." Meanwhile, the sad and aromatic "Pray for Spanish Eyes" is a seeming eulogy for lives lost to America's worsening AIDS crisis. The man Madonna still describes as her BFF, former Studio 54 bartender Martin Burgoyne, had succumbed to the disease in 1986. "How many lives will they have to take? How much heartache?" Madonna sings, pleadingly. It's certainly worth remembering that Madonna included an AIDS fact sheet with Like a Prayer in a bid to reduce the stigma and ignorance surrounding the disease, one the recently departed President Ronald Reagan had ignored for as long as possible. "People with AIDS—regardless of their sexual orientation—deserve compassion and support, not violence and bigotry," the sheet stated matter-of-factly. But the album's most shocking track is probably "Till Death Do Us Part." Underpinned by a deceptively perky keyboard riff, the lyrics hint at domestic abuse ("The bruises they will fade away / You hit so hard with the things you say") and violent rows ("He starts to scream, the vases fly"), offering a devastating summary of a dysfunctional relationship: "You're not in love with someone else / You don't even love yourself / Still I wish you'd ask me not to go." Coinciding with the end of Madonna's first marriage to Sean Penn (she'd filed for divorce in January 1989), it's one of the most affecting moments in Madonna's discography, though she'd later go on the record denying allegations that she had experienced physical abuse during their relationship. Still, the album never becomes too introspective to work as stadium-ready pop. The Romeo and Juliet-referencing "Cherish" is a retro melodic gem in the vein of "True Blue." The Sly and the Family Stone-inspired funk missile "Express Yourself" offers a feminist rallying cry that would inspire generations to come: Christina Aguilera and the Spice Girls have both hailed it as influence. When Lady Gaga's "Born This Way" debuted in 2011, many pop fans and music criticsnoted its distinct resemblance to "Express Yourself." Madonna said Gaga's song sounded "familiar" and felt "reductive," but Gaga insisted she didn't intentionally reference the Madonna anthem, telling NME in 2011: "If you put the songs next to each other, side by side, the only similarities are the chord progressions. It's the same one that's been in disco music for the last 50 years." The accompanying video is a queer classic that's been likened to "Tom of Finland meets Fritz Lang's Metropolis," with Madonna presiding over a futuristic city fueled by shirtless male workers. And the immortal title track mixes religious and sexual ecstasy so thrillingly, it could make a celibate atheist want to dance. Weirdly, the album's most throwaway moment is probably be "Love Song," a collaboration with one of the few artists of the time on Madonna's level: Prince. It's a vaguely experimental extended flirtation that mainly seems notable now because Madonna later re-used lyrics from its bridge ("Time goes by so slowly for those who wait / And those who run seem to have all the fun") on her Abba-sampling 2005 comeback banger, "Hung Up." Then again, perhaps we shouldn't be surprised that Like a Prayer's most heavyweight track on paper turns out to be its frothiest in practice. Like a Prayer is a rare beast: an iconic pop album that retains its ability to surprise you, using richly evocative songcraft to explore deeply personal themes—sometimes spiritual, sometimes socially conscious—from a woman's perspective. With it, Madonna had once again remodeled people's expectations of what a female pop singer could achieve. Decades before Beyoncé's Lemonade and Ariana Grande'sThank U, Next, it laid the foundation for the deeply persona pop blockbuster, auteured by a strong woman at the peak of her creative powers. Madonna's participation in the Eurovision Song Contest is currently unclear, after production officials reviewed the songs the singer was preparing to perform and found one of them to be inappropriate for the audience and expected atmosphere of the competition, according to Ynet. A new replacement song has not yet surfaced, and it is unclear if it will. A number of sources located within the Eurovision contest itself expressed their dismay with the intended performance of the song, while others said that artistic freedom should be respected and to leave the choice to Madonna herself. The acting director-general of the public broadcasting corporation is in favor of the latter and directed production not to interfere with her artistic expression. Meanwhile, Israeli media unofficially reported that Madonna filmed a political advertisement that would "lead to controversy." It is unclear if this is in any relation to the controversial song choice. "We've reached out to Madonna to try to add a little bit of glitz to the event," said Adams to Channel 12 News reporter Ben Mittelman. "It's looking very good that she's going to come here and participate in the Eurovision Song Contest." Last month, reports leaked out that Adams had approached KAN and offered to foot the bill for bringing Madonna to appear at the live grand finale in Tel Aviv on May 18. Ynet reported that Madonna had demanded more than $1 million to appear at the show. KAN's budget for the 2019 Eurovision – funded partly by a loan – stands at NIS 120m. Adams told the audience of global media professionals that hosting major international events in Israel is a serious boost for its image. The billionaire was a driving force behind Israel hosting the first three days of the Giro d'Italia bicycle race last year. "There's a steady drumbeat of negative news here, because of the density of journalists here in Israel, and here is one time where we were able to flip that on its head," said Adams. "Here, for a few days, people got to see us unfiltered in their own living rooms through their TV sets." Adams, who describes himself as a "self-appointed ambassador-at-large for Israel," said that events like the Giro d'Italia and the Eurovision are "a tremendous way to boost tourism. And I think the more people we bring here, the more people see our true nature, and the true beauty of our country and our people, and the freedom and openness and tolerance and safety of our country." He said he has been in talks with government authorities and ministries to establish a permanent fund to host and stage such events. "The Giro d'Italia was proof of concept – it was proof that there is no event that we cannot host here," Adams said. "We have the expertise to manage everything." We knew there was still another demo track, recorded by Madonna and Babyface in June of 1997, together with Never Love A Stranger, which leaked earlier this week. I'll Be Gone has now also been uploaded. You can listen to it below and read the lyrics here. After leaking the demo You'll Stay last week, the Youtube channel Madonna R&D has now shared several other demo tracks that were recorded in 1997-1998 for the Ray Of Light album, known as the 'Ray Of Light Album Assembly'. We've known about the existence of Never Love A Stranger for quite a while. Last year there was a snippet available online. Now the full version can be heard below. The demo was recorded by Madonna and Babyface in June 1997, but later abandoned. Read the lyrics here. This is the demo version of what later became the duet between Madonna and Ricky Martin. The demo, written and produced by Madonna and Patrick Leonard, features more lyrics, some which were later used in Frozen. The demo version of the well-known bonus track is less mysterious and also features some different lyrics, accompanied by William Orbit on the piano. We all know 'Flirtation Dance' was the working title for Skin. The demo was a slightly different trance beat, but is over all pretty smilar to the final result. This demo for Frozen is very close to the album track. There are just a few different lines in the lyrics, and some other musical arrangements. Also the demo for Nothing Really Matters was already close to the final edit. This week Madonna's iconic hit Like a Prayer turns 30. The song is, by all accounts, her most broadly beloved contribution to the pop-music canon, landing at #7 on our list of the Best Singles of the 1980s. Even the singer's most ardent critics can't help but bow at the altar of this gospel-infused conflation of spiritual and sexual ecstasy, a song that helped transform Madge from '80s pop tart to bona fide icon. To celebrate this sacred anniversary, we're taking a look back at the single's evolution over the last three decades. Following a teaser that aired during the 31st Annual Grammy Awards in January of 1989, Madonna premiered "Like a Prayer" in a Pepsi commercial during The Cosby Show, the #1 rated series on U.S. television at the time. Part of a $5 million sponsorship deal with the soft-drink company, the ad, titled "Make a Wish," was an innocuous bit of nostalgia that would soon be eclipsed by the scandal surrounding the single's forthcoming music video. Madonna dances in front of burning crosses and kisses a black saint in a church pew in this modern morality tale about racial profiling and pious guilt, prompting both the religious right and cultural critics, like bell hooks, to cry foul. Eventually, the mounting outrage caused Pepsi to pull out of their multi-million dollar deal with the Queen of Pop. The singer's response was coyly defiant. Madonna’s first live incarnation of "Like a Prayer" was also her best. Sure, her voice was raw and unrefined (“Life is a misstaree, eve’one mus stan alone,” she heaves), but her 1990 tour performances of the song displayed a rapturous, almost possessed quality that she’s never been able to recapture. Then notorious for forsaking her older material, Madonna dusted off Like a Prayer" in 2003 during the promotion of her album American Life. Thirteen years after her last live performance of the song, even Madonna’s comparatively reedier voice and noticeably more limited range couldn’t diminish its enduring magic. After performing crowd-pleasing but relatively anemic versions of "Like a Prayer" during her Re-Invention Tour in 2004 and Live 8 in 2005, Madonna reinvented the song for her Sticky & Sweet Tour in 2008, using elements of Mack’s "Feels Like Home" for an amped-up techno mash-up. Madonna closed her record-breaking Super Bowl XLVI halftime show in 2012 with "Like a Prayer," and though she wasn’t singing live, it was the closest she’s ever gotten to her ecstatic Blond Ambition performances. (For those lamenting the lip-synching, she would go on to reprise this version of the song, completely live, during her MDNA Tour later that year.) And if there were any doubt, a stadium of nearly 70,000 football fans waving flashlights and singing along is a testament to the song’s transcendent, all-encompassing appeal. The performance’s final message of “World Peace” seemed attainable, if only for a brief moment. Last year, Madonna dusted off her old chestnut for an epic performance at Vogue magazine's annual Met Gala. The event’s theme was “Fashion and the Catholic Imagination,” which seemed tailor-made for both the Queen of Pop and "Like a Prayer." Madonna slowly descended the steps of New York City’s Metropolitan Museum of Art in a shroud, flanked on both sides by a choir of monks, as she sang a Gregorian-inspired rendition of the pop classic. The performance also featured a portion of a new song, "Beautiful Game," and a cover of Leonard Cohen’s "Hallelujah."" It's thought the pop icon will be joined by "a bunch" of queens in her new clip. Madonna has recruited some former stars of RuPaul's Drag Race to appear in her upcoming music video. The Queen of Pop is currently gearing up for her return to the music scene, with the lead single from her upcoming 14th studio album tipped for release in the coming weeks. 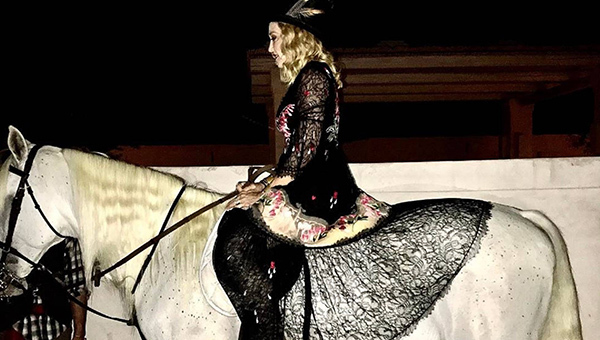 Earlier this week, Madonna revealed on Instagram that she was shooting the song's music video, and it sounds as though she may have some surprise Drag Race cameos. Among them will be the most recent winner of All Stars 4, Monét X Change, who is reported to have accepted a last-minute offer from Madonna, forcing her to miss a show in Denver. As a result, Monét has been pulled from the Haters Roast US tour, with a statement from organisers saying: "Sometime during the afternoon, we're told [Monét] received a phone call from Madonna with an offer to be in an upcoming music video. 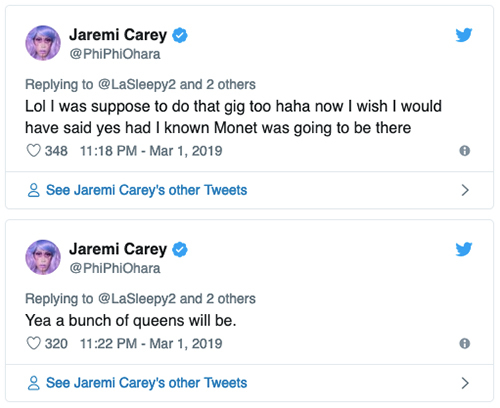 Monét asked [organisers Murray & Peter] if it would be ok to leave the tour to accept the offer. We said no because it was too short notice to replace her on Haters. "Just hours before the show was to start and without telling anyone including the other queens on the Denver show, Monet left the venue and flew to LA to accept Madonna's offer. Therefore, we have decided that Monet will no longer be on any upcoming Haters Roast dates." 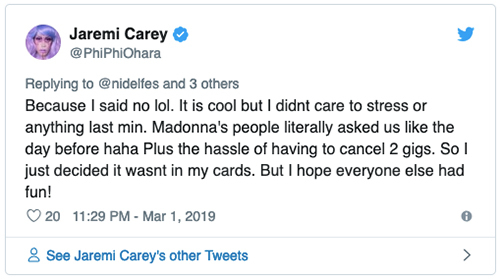 What's more, season 4 runner-up Phi Phi O'Hara revealed on her Twitter account that she had also been offered the chance to appear in Madonna's video, but turned it down. "The song is great. The video is political. The video will be controversial." Madonna isn't the first star to include queens from RuPaul's Drag Race in a music video, though, with Little Mix previously featuring Courtney Act, Willam Belli and Alaska Thunderfuck 5000 in their Power clip. Miley Cyrus also brought in a team of queens when she closed the show at the VMAs in 2015. 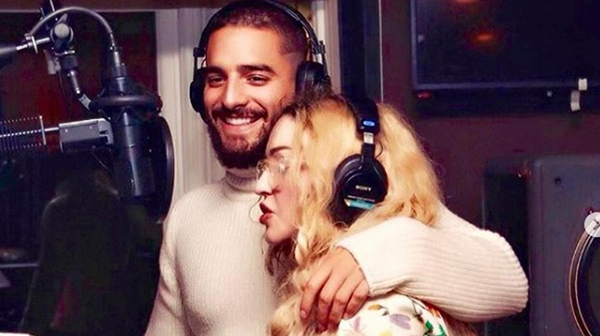 In an interview with Complex, Colombian artist Maluma talks about his new 'HP' video, his forthcoming album and about working with Madonna. You recently posted some photos of you and Madonna in the studio. How did that collaboration come about? It all started when I performed at the  VMAs. She was there in the crowd, and my manager told me Madonna wanted to meet me. We then met again in Los Angeles last week. She was in the studio working with different composers, producers. Everything was organic and we started making music. We were cooking some ideas, that's all I can say. We were cooking some beautiful songs. Will any of those songs appear on your upcoming album? The full list of special releases coming to UK record shops as part of Record Store Day 2019 has been revealed. 545 limited edition products ranging from live LPs, boxsets, albums never-before-released-on-vinyl, movie soundtracks, remix EPs, and unreleased rarities will be available across 7", 10", 12", picture disc, coloured vinyl and flexidisc (!) formats. Over 250 stores are taking part this year, the highest number in the event's history. DJ sets, in-store performances and mini festivals are planned in several record shops across the country for the big day on Saturday, April 13. Iconic stars and Record Store Day regulars like Prince, Madonna and David Bowie and Madonna feature once again in this year's listings line-up, with Bowie being the most purchased artist in Record Store Day history. "Replica of Japanese pressing of Madonna's ""True Blue Super Club Mix"" , with obi strip. On Blue Colour Vinyl. Tracklisting: A1 True Blue (The Color Mix) A2 Everybody (Dub Version) B1 Papa Don't Preach (Extended Remix) B2 Everybody (Extended Version) B3 Live To Tell (Instrumental)"
"Replica of the Japan-only EP release of "La Isla Bonita: Super Mix EP", originally released on May 1987 by Warner-Pioneer Japan. Includes "La Isla Bonita" (Extended remix), "Open Your Heart" (Extended Version), "Gambler", "Crazy for You" and "La Isla Bonita" (Instrumental). This version appears on green colour vinyl."